I would imagine that most of you are probably familiar with dbrand and their custom fit skins for devices like the Nexus 6. If not, you are about to be. 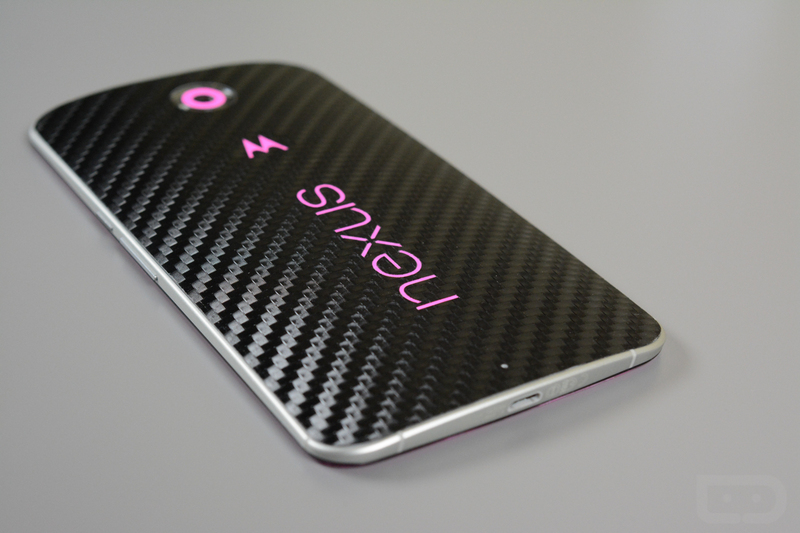 Their team sent over a Nexus 6 for us to check out, fitted with an unreleased and limited pink carbon fiber skin. They told us that this new skin is so limited, that sending us one to review for you was a difficult task. Kind of cool, right? If the limited factor in all this means little, maybe knowing that you will soon have a chance to win this particular Nexus 6 and its pink carbon fiber skin will? I thought so. As I mentioned, dbrand has been doing custom fit skins for a number of devices for a really long time. A skin, for those not familiar, is like a sticker that has been precision cut to fit perfectly onto your phone as if it were the phone’s “skin.” Get it? Skins are excellent options for phone owners who want a new look for their phone, but may not necessarily want to throw on a bulky case. Since the Nexus 6 is both a popular phone at the moment and Google’s new flagship, dbrand has decided to start making all sorts of skins for its owners. From classic matte finishes to metal to leather to “nature” and of course, carbon fiber, you can turn your Nexus 6 into the customized phone of your dreams. With dbrand skins, the Nexus 6 in particular, you can customize everything from the color of your skin to the logos that will appear on the back. Did you want a Nexus 6 sans “Nexus” logo? You can do that. Did you just want a Nexus “X” in the middle with no Motorola logo? You can do that too. Your list of options to customize is quite lengthy. 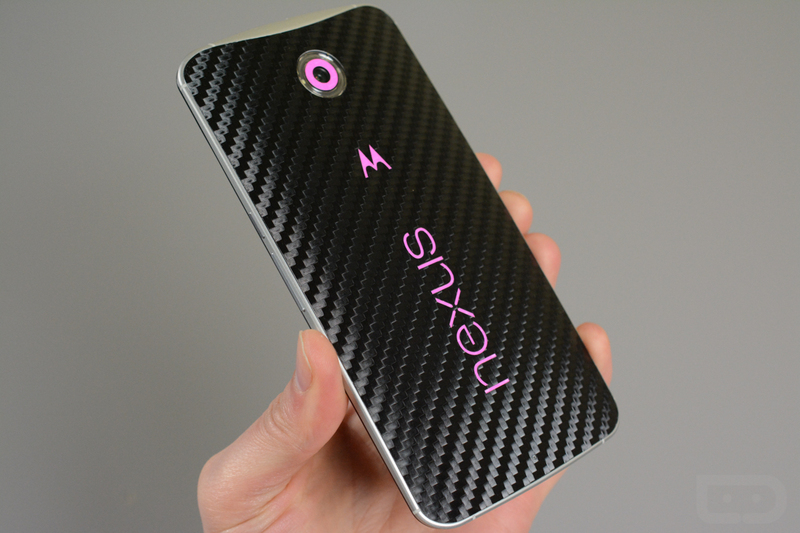 As for the carbon fiber skin with pink that has been fitted to this Nexus 6, all I know is that this thing fits like a glove. In hand, it feels as if this phone was made with a carbon fiber backplate rather than as a phone that has been covered in a skin. 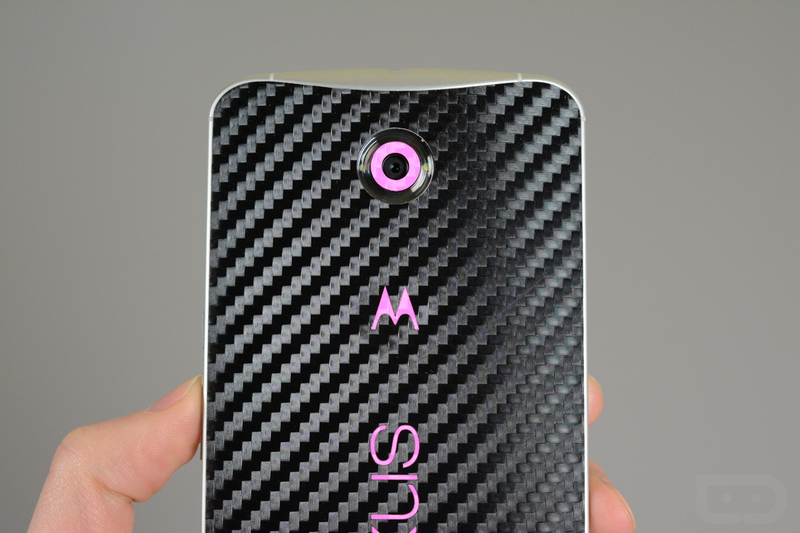 The carbon fiber adds some really nice texture, which is important for a phone the size of a whale. I could probably do without the pink sticker surrounding the camera, but the subtle pink highlights for the Motorola “M” and the Nexus logo add a really nice pop to the experience. 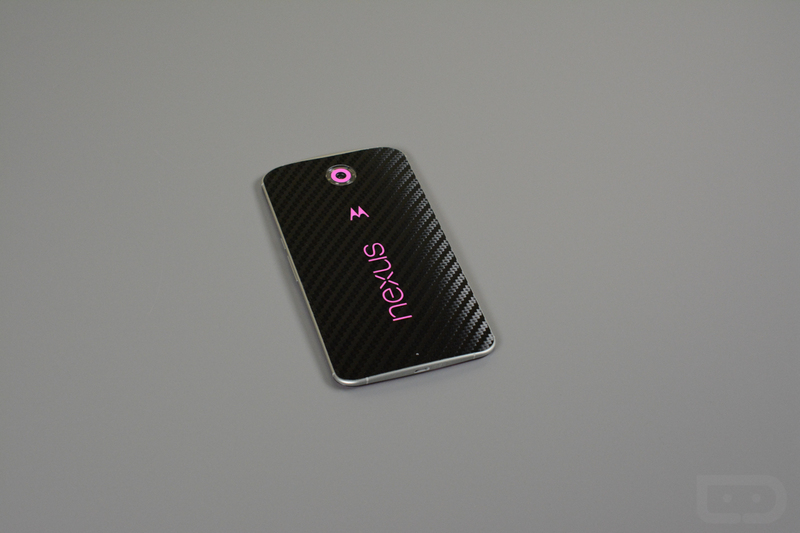 If we move on from the back, you can’t help but notice the wild pink carbon fiber skin that has been attached to this phone’s front. “Wild” might even be an understatement. This thing is bright. This thing is pink. This thing is, not exactly something that most of you are going to jump for. 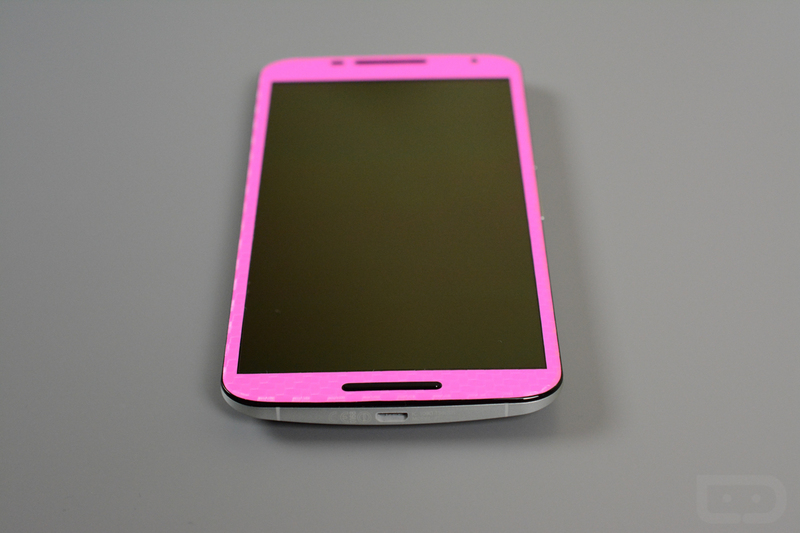 I can do pink highlights all day on the back of my phone – I’m just not so sure I can do full-on pink front plates that I have to stare at each time I use my phone. But hey, maybe some will really love this. 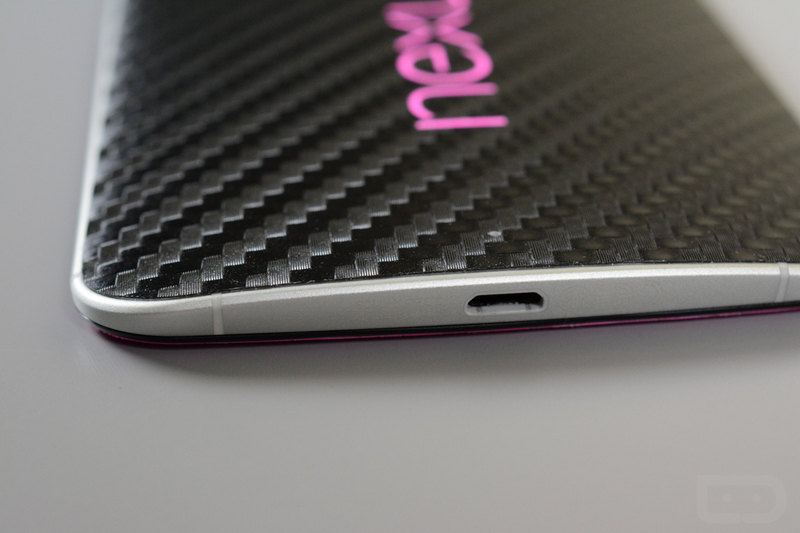 Overall, I am quite impressed with the fit of this dbrand skin on the Nexus 6. I was a little worried that it would add some weight or maybe even some unnecessary bulk, but it really hasn’t changed either. As someone who hasn’t spent much time with skins in the past, this may have sold me on picking up a couple for other devices of mine. I may even pick up a couple for the Galaxy S6, since they are already selling those as well. 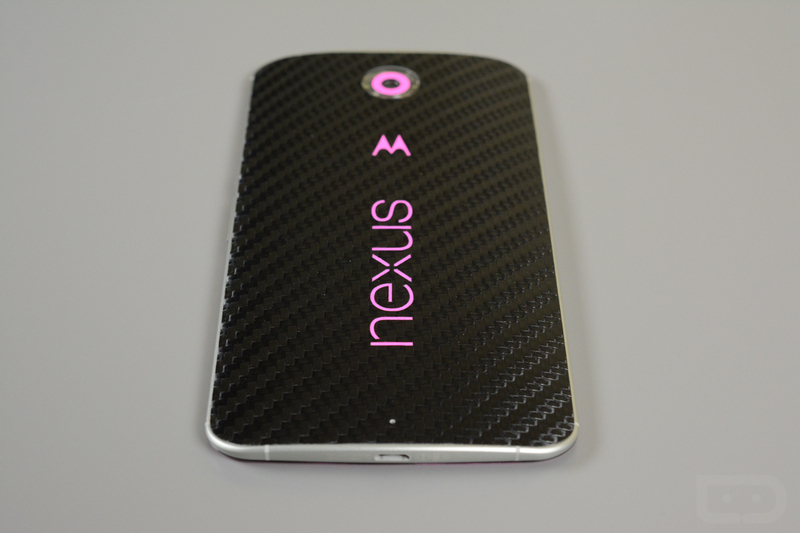 If you want to pick up a dbrand skin for your Nexus 6, be sure to check out their shop.